Tartelette: I Think I Read Wrong...Croissants??? I Think I Read Wrong...Croissants??? I strongly remember uttering these words one cold morning while spending Christmas at home... Let me give you the lowdown: a couple of months ago, as I was exchanging emails with Lisa, she mentionned that she, Yvonne, Peabody and Brilynn were going to make Biscotti and apost about it on the same day. Would I like to join in? Never the one to refuse an invitation, especially when it involved baking, I jumped on the offer, especially after I read about their first collaboration. It was fun, I had a good time and of course ate too many... Could not wait for the next cross baking post but figured that it would have to wait until after the holidays. Imagine my surprise when Brilynn emailed her interest in croissants...I did not mean to sound blase or anything but I thought "clearly, she must not have made any or it's been a while..." and then I put the whole thing out of my mind, well, not really as I was myself on a croissant tasting tour of France!! When you work in a bakery, there are usually two people making croissants, one folds and turns, one cuts and shapes. Your baking schedule allows you to start the dough early one day and make other pastries and desserts while you fold and turn your dough several times. At home, you got time to read, clean or relax and if you mess up you won't have a 6 feet tall Executive Watchdog yell at you unless you are married to one and he is extremely hungry. Back to the present. When I got home, we all had agreed on croissants (hey I am game for anything, just meant I would have to run a few extra miles), our group now also included Quellia and Veronica. I was really excited about baking with this group as we all come from various countries, different cultural and culinary backgrounds, different moments in life, better-halved or not, with/without children, different jobs, occupations and hobbies. and I knew as I have often learned in a pastry kitchen that it would mean 7 different interpretations, readings and outcomes of the same recipe and that was really great... we had found the essence of baking and cooking, our Holy Grail. I have relied on the same 2-3 same croissant recipes over the years so I was excited to try this new one from Tartine, and I bow to Veronica's computer for posting the recipe! The main differences for me was the use of a pre-ferment and a rectangular fold. I had planned to get on the same train as everyone else and start on Friday but my plans got derailed....I thought that over the years my husband had come to understand that when the words "making croissants" are spoken that means "you are on your own Bubbah"...well , my timetable got a little shaken as B. committed us to a dinner with our bestfriends (would not want to miss it) and half the neighborhood ended up in my living room on Sunday afternoon. Talk about making me nervous...I mixed the dough saturday morning, add the butter and gave it a first turn saturday before dinner. Gave it 2 more turns early Sunday and had to wait for the evening to roll, cut and shape. I have learned that too many turns does not necesseraly gives a better croissant so I stopped at 3 turns, but I am glad to see that 4 worked for some of us. I have to admit that I only strayed in one thing: I used the old square fold (image courtesy of Le Petrin)to incorporate my butter and give the first turn. Why? Old chef taught me that way, I succeeded making them ever since and it became half old habit - half superstition. As I was the last one the start, I received the blunt of everbody's fears, excitement, questions, and success as I woke up Sunday morning to 57 emails!!! As the day progressed, pictures starting trickling in and I was cheering "allright!" "you go girl" "oh man!" A sisterhood of croissants, all these women devoting their love of baking to pounds and pounds of butter and flour...with success! Don't you wish ya'll were our neighbors?!! In the end I rolled half the dough for regular small croissants, 1/4 for chocolate ones and I froze the remaining quarter for Marzipan filled one for later. The chocolate ones did not turn up as flaky and moist as I would have wanted, this maybe due to the fact that I waited a while after the last turn and the weather changed on me. I am going to wait a few weeks....I love my arteries too much. If you make them, do not schedule any blood work the week after and deliver them to your neighbors walking not driving, your thighs will thank you! i couldn't believe that i saw two wonderful posts about croissant today. 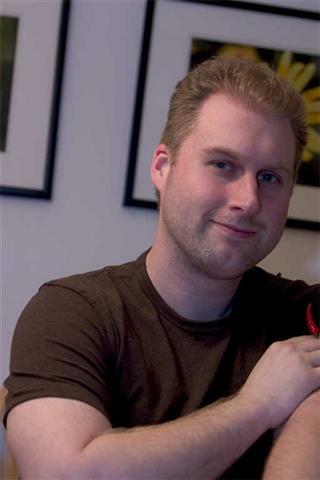 the first one was at brylinn's blog. i've never attempted to make croissant before but your post give me a nudge to try it one of these days. Don't feel bad...I did the square fold too. I have to admit that I'm a bit afraid of making croissants. All of you are such an inspiration! Well, your the last in this cross post. What a fun series! The croissants look lovely! Walk them to the neighbors...yes! No blood work the week after...check. Makes for just 57 emails, now that would blow your mind, ummm maybe the arteries also! 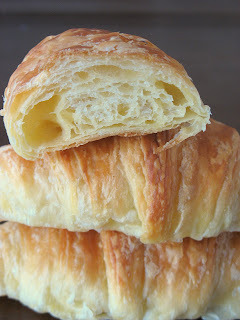 Your croissants look fantastically buttery and flaky and that last photo had me swooning all over again! You are phenomenal Helene! I don't know how you managed to make the croissants facing the odds you did. I probably would have strangled the hubby by now. 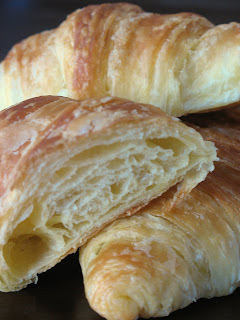 Beautiful croissants it looks so flaky I'm sure it smells and tastes so buttery too! Yours are so flakey! And I don't know what you're talking about, that chocolate one looks perfect! Man...I've never made Croissants before...I'm now at least curious! This is just so funny! Really! I'm glad you joined in and I love the croissants! Hi Helene! Your croissants look like they turned out beautifully! I've had a long of fun reading this "saga" - detailing everyone's adventures! Ever since I saw an Alton Brown show on making pate a choux I've been meaning to try some pastries. Your croissants look just wonderful and maybe I'll finally give them a try. Thanks for the inspiration! Quand est-ce que tu les livres chez MOI? Oh, I've so enjoyed following the croissant making adventures of you and your brave fellow bakers! Yours look so light, flaky, and Mmm-mm yummy. You all are so adventurous! 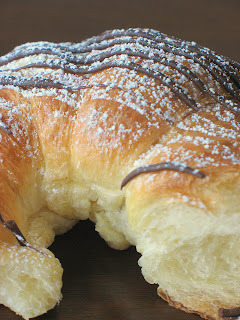 Your croissants look really good, but the chocolate ones are mouth watering! La dernière photo est mortelle ... C'est pas grave pour Noël, moi aussi j'étais très débordée ... Alors à une prochaine ! C'est carrément l'apothéose quand on réussi ses premiers croissants. WoW!! Nice croissant!! Did you guys just use all-purpose flour? or did you add other types of flour?? Wow, your croissants look so great! I became inspired by you guys' amazing results and am now just beginning my croissant marathon. I will take pictures as I go along and cross my fingers.